I always enjoy seeing what specific decorations make their annual appearance in everyone's homes. Although I've had the duplex pretty much decorated since before Thanksgiving (no regrets! ), I recently snapped a few photos to share here. I do dream many-a-dream about how I would decorate a fireplace and mantle, or a beautiful staircase, or a front porch for Christmas, but I'm still grateful for the few simple ways I can brighten up our humble abode. The good ol' floating shelf is always my favorite part, because it's a centerpiece of our living room. I made the felt trees a couple years ago using felt from here and some foam cones from a local craft store. Cheap and easy and I still love 'em! 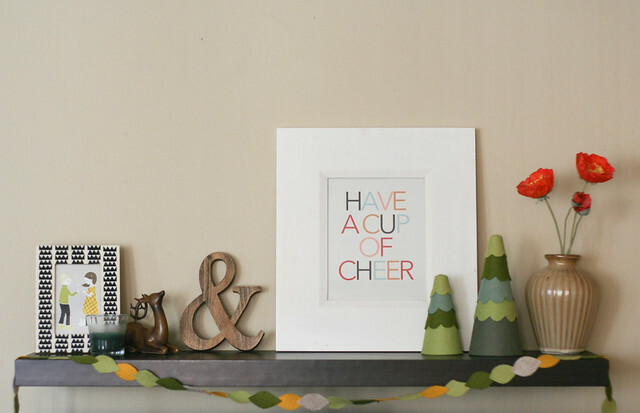 The "cup of cheer" print is from Show + Tell, and I can't recommend it enough (only $10 for an 8x10, and it is so adorable!). As for a few other details: the deer was purchased on clearance at CVS ages ago, I made the felt leaf garland, and the wooden ampersand was a birthday gift from this shop. It fits perfectly on a blue shelf that is near our dining room table. I'd say this nativity set is pretty close to perfect. I hope Eisley has fond memories of it as she gets older, the same way my sisters and I think of our parents' nativity from our childhood. Our tree is covered in ornaments old, new and homemade, and I ended up forgetting to get a full photo of it! (It's actually probably for the best, because this $25, 8-year-old Walmart tree is on its last legs…there's a portion of the lights that are actually currently out, and I need to fill them in with replacements.) I always love bringing out the box of ornaments from my childhood, as well as Jay's. And it makes me excited to add on to Eisley's collection each year, too! My older sister bought me this handmade advent calendar a couple years ago (found here) but I didn't get it out until this year because I never knew where to set it up! I finally took down the photo collage from Eisley's birthday and knew it would be the perfect place for this to hang. 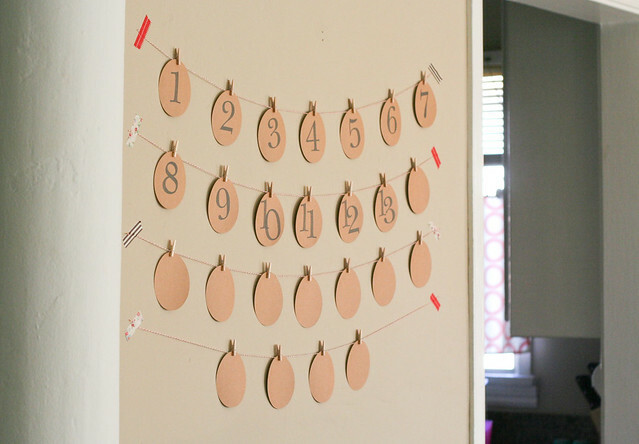 The style and simplicity of this advent calendar is definitely up my alley. Super easy, colors that are neutral, and a design that appeals to the crafty-lady in me. 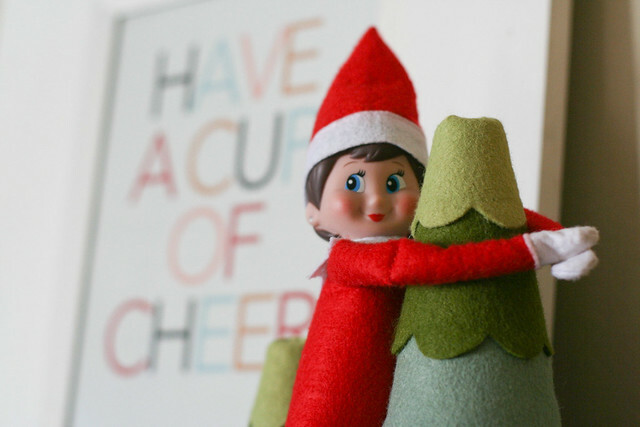 I was able to get an Elf on the Shelf early this year when I found it on sale (and the darn thing is never on sale!). I was super excited to get it out this year, and Eisley has had fun trying to figure out where Sparkle (or Lilly, depending on the day) will be each morning. I'm definitely not one of those moms who does something creative every day, and I'm totally okay with that. It's still a fun tradition, either way. 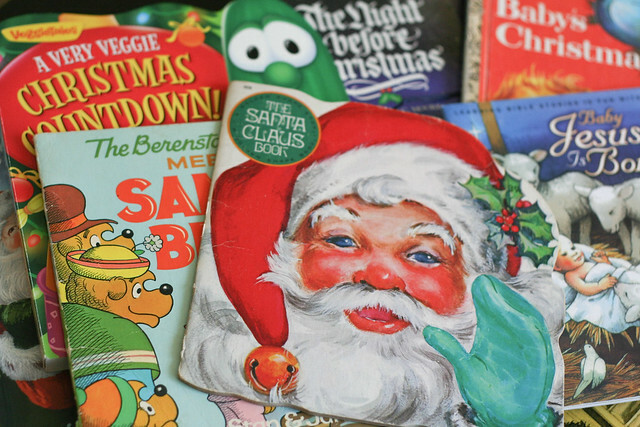 And, of course, there is always a stack of Christmas books (old and new!) hanging around on some table or another. I love them so. 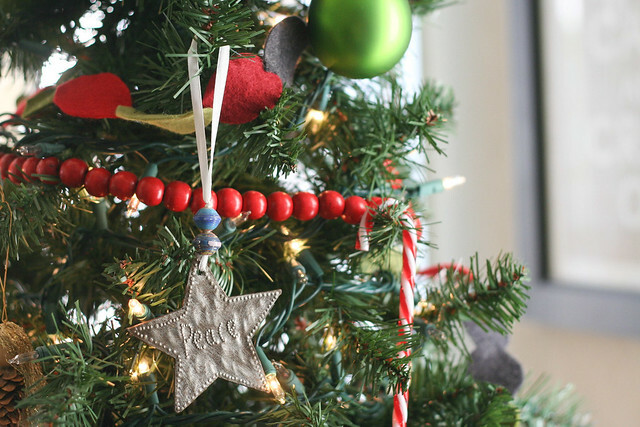 What does your home look like for the holidays? Did you post about your own decor? Let me know in the comments, because I'd love to see! I love everything you've done! 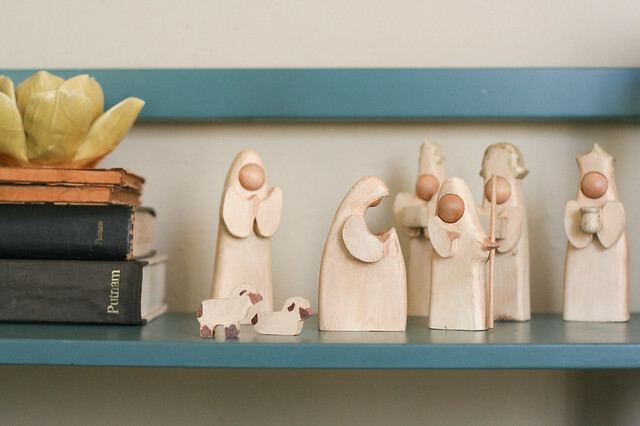 I also love your nativity scene and how it's wooden and simple. We have a simple wooden one as well and it took me ages to find one that wasn't overly garish (in my opinion) or $100 for each piece. Those felt trees are SO cute!! Love seeing your decor and how it changes through the seasons. I love your Christmas decor, especially that Advent calendar! 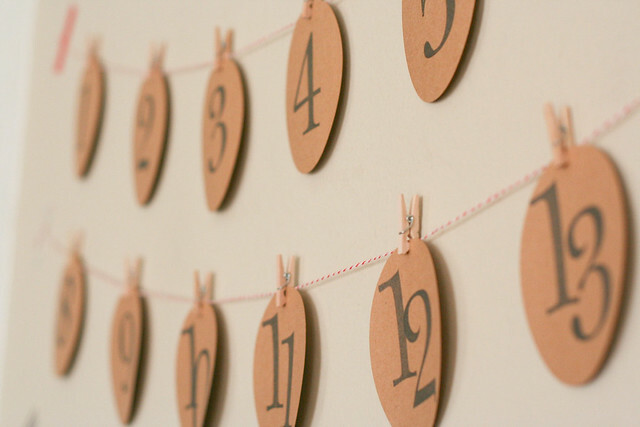 I always plan to do something creative for Advent but I always (always, always!) 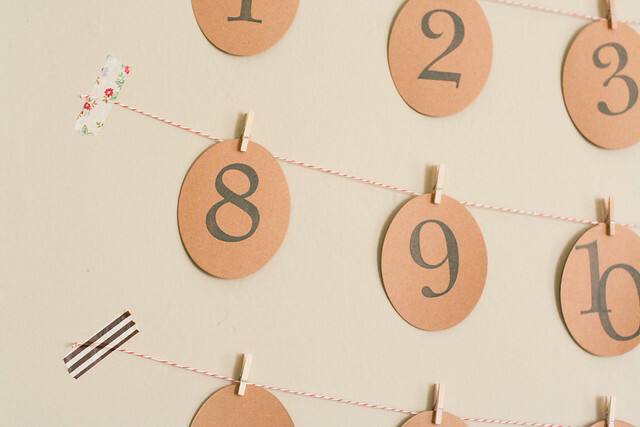 end up buying a chocolate Advent calendar at the dollar store! 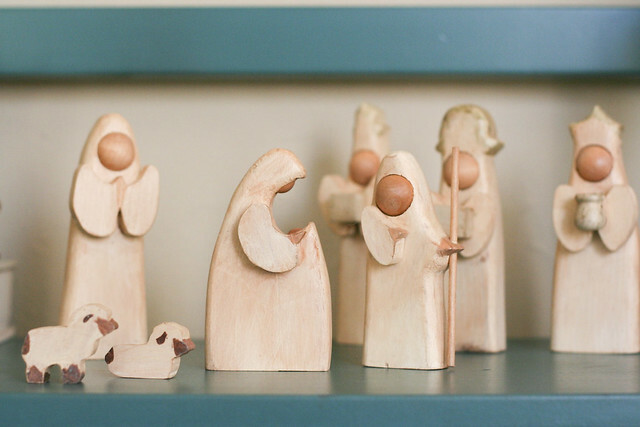 I love your nativity scene! 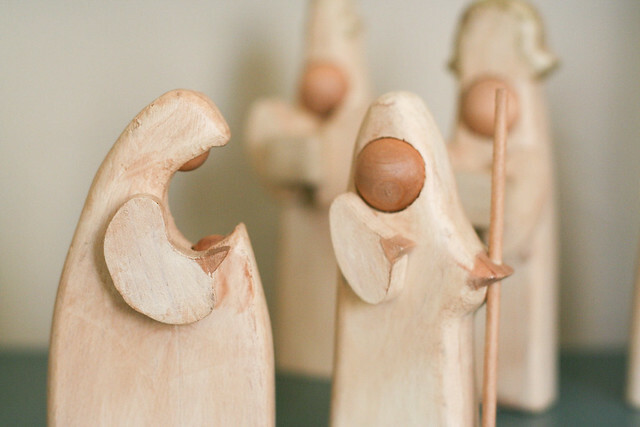 We bought the Little People Nativity Scene last year and the kids love playing with it! We don't do Elf on the Shelf but we hide Mary and Joseph for the kids to find. They're travelling to Bethlehem, so every day they're somewhere new!